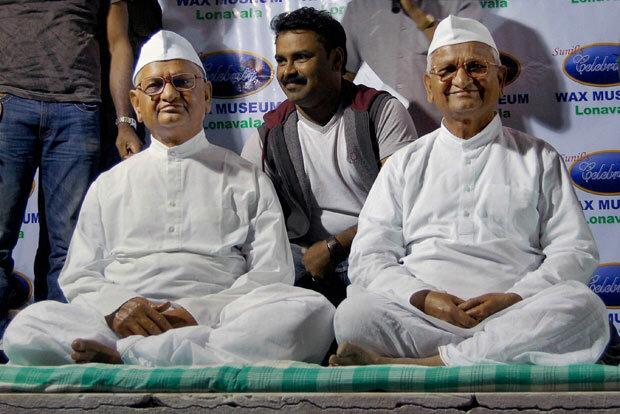 Anna Hazare's wax statue was recently unveiled at his native town of Ralegan Siddhi in Maharashtra. The creative hands behind Anna's statue is Sunil Kandalloor's. Kandalloor said that that was his own way to garner support for Anna's anti-graft movement. It took 25 days of dedicated work, 25 kg of wax and Rs 1.5 lakh to craft the statue, which is kept in the museum. When asked what type of statue he wanted, Hazare told Kandalloor that he would like it to be in a sitting position. Hazare donated his trademark Gandhi cap and his clothes for the statue. 0 Response to "Wax Statue for Anna Hazare"